As a complication of a Fracture involving the Face the Tongue falls backwards and onto the Oropharynx obstructing the Airway. In this type of fracture it is very important to take necessary precautions, as the tongue falls back it obstructs the airway or Oropharynx region which prevents air intake and can lead to death. Hence keeping the tongue positioned anteriorly and away from obstructing the airway will help in breathing of the patient. 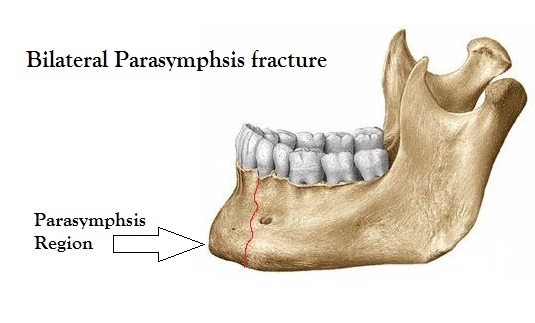 Bilateral Parasymphysis Fracture: Tongue falls Backward, here the removal of all tongue attachments to the mandible makes the tongue fall back and obstruct the Oropharynx. Due to the presence of muscle attachments to the inner aspect of the Parasymphysis of mandible which are attached to the anterior 1/3rd of the tongue and keep the tongue from falling back. When mandible is fractured in Parasymphysis region this muscle attachment is lost or broken and hence the anterior part of the tongue falls back into the oropharynx as there are not attachments to hold it in positon. In case of General Anesthesia, the Tongue falls back and obstructs the airway as well hence an Airway tube is inserted to maintain the airway passage and prevent fluids from seeping in into the Lungs. It is very important to maintain the position of the tongue when the diagnosis of a Bilateral Parasymphysis Fracture is made, as the patient does not have control over the movements of the tongue. As mentioned above this is due to the loss of attachments to the Mandible which help in these kinds of movements. It is important to make sure that the attachments are restored during treatment of the bilateral para symphysis fracture of mandibular to restore normal function and movements of tongue.